Kane is a character in the Grand Theft Auto series who appears as a minor character in Grand Theft Auto: San Andreas (set in 1992). He is one of the leading members of the Front Yard sub-sect of the Ballas gang. He does not speak during his only appearance. Kane, presumably born in Los Santos, at an unknown time joined the Ballas gang and rose to prominence within the gang, later becoming one the highest ranking gangsters of the Front Yard sub-sect, being described by Carl Johnson as 'Front Yard royalty'. In 1992 Kane attends of funeral of Little Weasel, who died trying to keep Glen Park a Ballas territory. 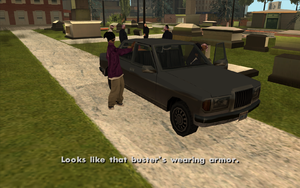 The funeral, however, is ambushed by Johnson and Sweet, the two leaders of the Grove Street Families, in retaliation for the Ballas ambushing their mother's funeral. The two then attack and manage to kill all the attending Ballas gangsters, including Kane. Kane does not have a unique character model, sharing his design with one of the normal Ballas gangster models. This page was last modified on 22 January 2014, at 00:09.